Good performance, but what about their support? I’ve been a paying customer for A Small Orange for the last 41 months. During that time, I’ve monitored their performance – avg. load time and uptime. What is A Small Orange? A Small Orange was acquired in 2012 by Endurance International Group (EIG), the same conglomerate behind the more popular (and straight-forwardly named) Bluehost and HostGator. That might be a warning sign for a company whose tagline is ‘homegrown hosting’. However, unlike those two more notable brands, A Small Orange seems to have not lost their straightforward approach. We set up a basic WordPress website on one of their cheapest hosting plan ‘Tiny Plan’ (cost $71 without a domain name) back in June of 2015, and collected uptime & speed stats over twelve months that you can review here. How do they compare to their better-known sister-brands? Let’s take a look. Originally launched back in 2003 by Tim Dorr, A Small Orange now has two server locations in Dallas, Texas and Dearborn, Michigan. A Small Orange, despite their small status and whimsical name, has been in this business for a while. The data proves that they know what they’re doing. Getting your website featured on a major publication can unleash a flood of traffic within just a few minutes. That exposure is amazing… Until your site crashes! Unfortunately, it doesn’t matter how well your site performs if it keeps getting knocked offline by an under-performing web host with poor uptime statistics to support its performance. Fortunately, that’s not the case with A Small Orange. Our analysis showed an uptime of 99.99% over an eight-month period (.05% better than the industry average). That’s phenomenal – they are far out-performing the bigger, more notable names in the industry (including their sister companies). We’ve established that a stable site is critical to website performance. Even a stable site, if slow, can quickly become worthless. Research shows that a one second delay in site load time can result in a 7% conversion loss. 40% of your site traffic will leave forever if it fails to load in under just 3 seconds. Fortunately, A Small Orange delivered average page speeds much faster than the industry average (clocking in at 700ms, which is about 24% faster than the industry average of 890ms). Even stable, fast sites need great support for random issues that might pop up unexpectantly. I love that A Small Orange didn’t just attempt to send out links to solve my problem. They actually took the time to speak with us, unlike some other web hosts we have reviewed in the past. Considering their excellent uptime and average page speeds, A Small Orange is relatively inexpensive. Their cheapest shared hosting option (the ‘Tiny Plan’ which we set up for our test site) will only set you back about $71 per year (which translates to about $5.92). The great news is that, unlike most other web hosting companies, there’s no hidden language or absurdly long commitment you need to make in order to get this low price. What you see is what you get with them. All plans (excluding ‘Tiny’) offer premium features. A positive side effect of their honest approach is that there’s no ‘hidden’ agenda or language to mislead you. For example, most web hosts make hyperbolic claims like ‘unlimited hosting’. But most don’t actually deliver unlimited benefits. A Small Orange doesn’t do that. They spell out, in plain English, what you’re going to get for your money. In addition, each plan on their site provides all of their premium features (with the exception of their ‘Tiny Plan’), including unlimited email, 24/7 U.S. based support, SSD servers, and unlimited domain names. Standard industry practice might give you a 30-day refund if things don’t work out as planned. Again, A Small Orange bucks the trend by providing up to 90-days to get your money back. Only a company willing to stand by their service would offer such a long refund period, making it relatively low risk for you to test drive. By the way, InMotion Hosting offers also a 90-day money back guarantee. The rest should be around 30-45 days. Money back guarantees are huge because you don’t have to feel uneasy about committing to a web host only to find that you don’t like their services and features. With A Small Orange, you won’t have to feel stuck paying for a service you hate. Be aware that refunds don’t apply to certain payment methods. According to A Small Orange’s Terms of Service, you won’t be able to get your money back if you pay with a bank wire transfer, Western Union payment, check, or money order. Be sure to pay with a debit card, credit card, or PayPal to ensure that your account is eligible for refunds. A Small Orange passed most of our tests with flying colors. However, there are a few things you should be aware of before handing over your credit card. In the event that you exceed your plan’s limits, A Small Orange might suspend your account immediately. This is in their Terms of Service when you sign up, leaving you with no alternative but to agree when you get started. While most of their plans offer a decent amount of bandwidth, just be aware that this is a possibility. When it comes to resource usage, A Small Orange claims that each customer is required to use as few server resources as possible so that all customers on their servers experience good performance. The same applies to bandwidth usage. They allocate you a monthly bandwidth allowance that is based on the hosting package that you purchase. You upgrade to a package that has more total bandwidth. They can charge you an additional overage fee regardless of how you choose to reactivate your account. A Small Orange’s customer service is fantastic. They were extremely quick and detailed in our experience, with 24/7/365 availability. The only problem? No phone support. Instead, they rely on an in-depth knowledge database, live website chat, and email. Most other web hosts offer phone support, so the gravity of this ‘con’ might depend on your own personal preference. Throughout our test period, A Small Orange performed admirably on the primary tasks of a web host (uptime, speed, and customer support). Online you’ll find other reviews that aren’t so glowing. Our objective is to always provide a holistic review and there are reviews out there which contradict ours. The company doesn’t just have a poor reputation when it comes to reviews, either. Several Twitter users have taken to the social platform to speak negatively about A Small Orange’s services. 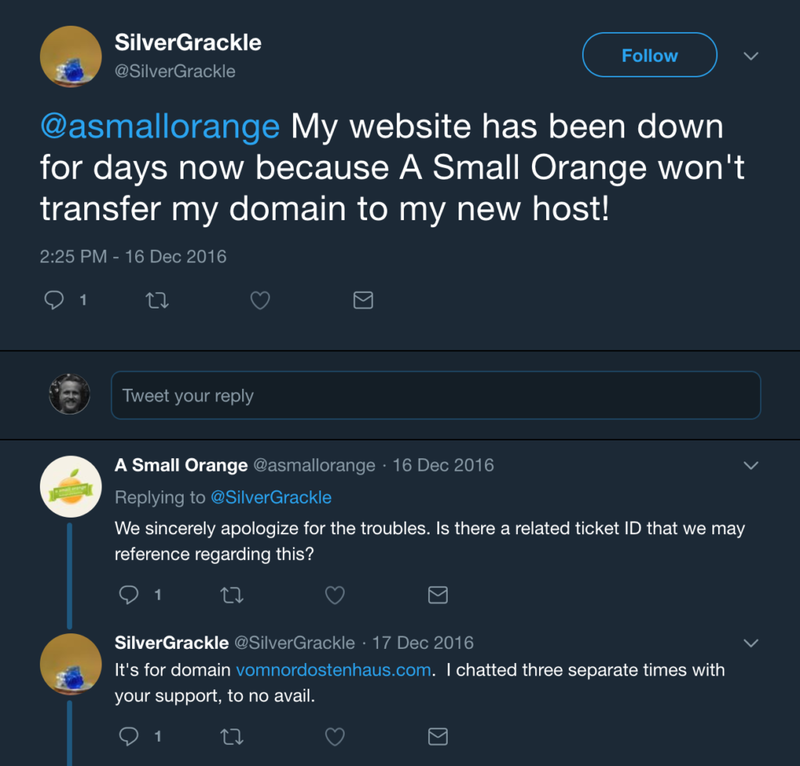 One user even claimed that A Small Orange wouldn’t transfer their domain to a new web host in 2016. In 2017, it appeared that the overall conversation about A Small Orange is still just as negative, even if we don’t agree. A Small Orange responded to both tweets and seemed to attempt to rectify the issues. Tiny Plan: This plan costs $71 per year (with no month-to-month option). It comes with 500 MB of storage, 5 GB bandwidth, 24/7 email + live chat support and a maximum of 1 domain name. You need to pay for at least one year if you decide to go with this plan. – This is the plan we used for testing. Small Plan: This plan costs $86 ($7.17 per month) per year (or $8.00 monthly) and can be at a cheaper rate if you pay for one year or more at once. It comes with 5 GB storage, 50 GB bandwidth, unlimited domain names, 24/7 email, and live chat support. Medium Plan: This plan costs $124 ($10.33 per month) annually (or $15.00 monthly). It comes with 15 GB storage, 150 GB bandwidth, unlimited domain names, and 24/7 email and live chat support. You can pay less if you decide to pay for a longer period of one or more years. Large Plan: This plan costs $228 ($19.00 per month) each year (or $25.00 monthly). It comes with 30 GB storage, 500 GB bandwidth, unlimited domain names, and 24/7 email and live chat support. It also costs less if you order for a period of more than one year. All their shared hosting plans, except the Tiny plan, come with support for unlimited domain names, unlimited emails, 24/7 support, and SSD. Ease of Signup: Single sign up page. Easy sign-up process. Payment Options: Credit Card, PayPal. Hidden Fees and Clauses: No hidden fees. A limit of 10 percent CPU usage, 5 percent memory usage, 50 running processes, 15 minutes max execution time, 100,000 total nodes and 500 outgoing email messages per 60 minute period is enforced for all shared and reseller packages. Control Panel and Dashboard Experience: cPanel available. Installation of Apps and CMSs (WordPress, Joomla, etc. ): Softaculous available for one-click installation. Do We Recommend A Small Orange? You’ll probably get the most bang for the buck as they’re really cheap compared to others. Stable uptime, quick page loading and a friendly chat with a knowledgeable support representative proved that A Small Orange knows what they’re doing. They’ve been one of our TOP 6 hosts for a few months now for a reason. What’s good about A Small Orange? What’s bad about A Small Orange? Have you used A Small Orange hosting? If so, please leave a review below. Good or bad – doesn’t really matter as we’re trying to keep our reviews transparent and honest. I switched over to A Small Orange in 2012, initially, they were great, with good support, you could actually speak to someone on the phone and they assisted with the migration of my server from another provider without any major issues. I have a dedicated server running over 15 websites, and I honestly regret now transferring to them as since that initial migration their customer support is HORRIBLE. They seem to have changed their support to outsource it to India after I transferred, and every time there is even the smallest issue it takes DAYS to resolve - sometimes my entire server is down for 3-5 days. My server was hacked, and even though with a dedicated server I am supposed to get 24/7 priority support no one was able to help and I ended up having to hire company Bob Cares to stop my server being hacked. I should not have to hire an outside company for tech support! Even small issues sometimes takes days for them to resolve, every time you contact support (which is online chat only) you get a different person and most of them have no idea what they are doing as they are just following screen prompts, not really techs. You have to wait for a "senior admin" to assist which can take forever - especially if you have issues over the weekend or a holiday. I would not recommend them whatsoever - unless you are a tech genius who never needs any assistance with the constantly evolving system upgrades, PHP and server upgrades, hackers and malware scams etc etc - as if you have even the smallest problem rest assured your sites will be down for a while. Also their prices are pretty high considering what you receive compared to other hosting providers that do offer phone support and have real techs based in the USA that speak english to assist with any issues as they come up. A very helpful crew when I can't figure things out. (Which is ... routine.) There are still a few things I have NEVER been able to figure out, however...things that are likely super obvious to people more familiar with web pages and I often find that helpful videos and instructions still leave out "obvious steps" that I can't quite discern. Like: now go copy & paste that HTML...somewhere...well, where? I have no idea. So, some things don't get done ... but I muddle on. I have been with ASO for over 10 years and definitely noticed right away when they were bought out. Customer service went out the window completely! I'm kicking myself now for not switching away from them when problems first arose. But here I am with a broken email since last Thursday, had several live chats (because they seemingly can't pay people to pick up the phone!) and emails from their 'specialists' every 24 hours with no helpful information. The useless folks they have on live chat just spit out answers from their online resource training they were given. One today actually asked me to give them specific information about all of the emails that didn't come through - how am I supposed to know, they didn't come through!!! Sorry for the rant, but run far away from this company! Stay away at all cost, my son bought 6 domain names last year as he was experimenting with SEO, anyway this year 3 months before they were due renewal they took 95 dollars from my account even though we didnt want to renew them, when I messaged and said, no we don't want them renewed and anyway it's 3 months too early they said tough! It's too late now we can't refund you. This is to a 5yr customer too, I'm reporting to bank and credit card company as I'm sure this is fraudulent, but think twice before giving these people your credit card details. Scam artists. The company used to be fine. Then they sold out, outsourced their support staff, dramatically increased their prices (saying it was needed to "continue to provide world-class service" -- seems like something you would tell your paying customers if you were in fact providing decent customer service), started billing renewals way in advance, and then lied about providing a refund. I've used A Small Orange for years. Even thought I had only active site on my shared hosting account, I was happy to pay because if I got good support if I ever had a question. Those days are gone. It feels support is totally off-shored and outsourced including billing complaints and technical support. If you try to chat with support now, you will probably in a half hour to 45 chat session. The result of that will be a combination of no information and disinformation. It's happened to be twice or thrice by now. If the support rep creates a ticket for you, the person that picks up will be asking questions back to square one. I know a lot of other companies have dropped to this low level of service, but I'm very upset a company I trusted to have my back does not. There is no longer a corporate contact clear posted. If you call the number listed on the companies own DNS records, it's permanently busy. Not good. Absolutely the worst hosting on the planet. Choose anyone but ASO. I have been using them for a long time and have finally had enough. Their support is horrible. Once I finally got uptimerobot.com, I realized just how unstable their servers are. My sites will be down for 12-14 hours at a time. I have a feeling this company will be bankrupt before long. There is no way customers can continue using this service. I just need to get my sites up so I can transfer to another service. When we first chose A Small Orange the customer service was fast and helpful with all issues (2015). Unfortunately, their customer service has changed for the worse. Online chat required 45 minutes to request a refund when cancelled services were automatically billed. Even the most basic questions require 4-5 minute hold while the representative "investigates". Customer service rep rarely is able to resolve the issue but instead has to submit a ticket. This is billing and not technical support. When I did need technical support the information given was incorrect and inconsistent with the next customer service representative. I recently tried to get a second VPS and after payment setup was 48 hours. I couldn't wait and went to another provider that could offer a VPS immediately. It's too bad but this company's service tanked in the last year. I have left them and will not purchase servers from them in the future. Be aware that they will retain your information for a few years after you leave. I found this out when I tried to delete my account. At first, I just asked to close my account. Then I asked if they can delete my credit card information. They did close my account, but they said that they cannot delete my credit card information. I ask them why, they told me for auditing reasons. It sound reasonable to me but then I asked how long do they hold on to the information. They said 3 years. I asked them where in their user agreement that it said anything about this. They told me that the user agreement has not been updated. Its been months and the still have not updated the user agreement. ASO was a good company and I had no idea they sold off to some other group. I needed a simple configuration on their end for an addon domain, and the tech support person overseas was blatantly incorrect on their assessment. They be like "oh it looks fine our our end", escalate it, and then 5 hours later I get an email from another fool "looks like its working". What B.S. I test it on my own ISP, then 4g mobile, then VPN. They are outright lying or ignorant. I will never give this company another dime. Run! Here is a nightmare story for you. We were a paying customer for 5 years. This company touts itself as having amazing customer service, but what you get is a live chat person oversees who then escalates your issue to someone else who then eventually after 12-24 hrs will get back to you with a vague answer. Sometimes a resolution to problems take a week or longer. Our worst experience was at the end, when their billing system stopped saving our card that was on file for recurring payments. When we realized what happened, we reached out to them to find out if we could fix the issue. So they finally got our card tied to the account and their system overcharged us for 1 extra month. I had to bring it to their attention and they credited me back for the overcharge. 3 days later their system terminated our account citing 1 unpaid bill (even all bills were paid). They terminated us on December 3rd and our account was paid up through Dec 26th. We had no idea the account was terminated when it was because our site was still up and running for 3 months after termination. When the site finally went down and we discovered what had happened, they no longer had any backups for our data because they only back it up for a couple of months after an account is terminated. Needless to say, we are still working on resolving this with them. My client ordered an SSL certificate, but two domains are present on that service (you have to order SSLs on the VPS page, not the domain page, and no, you do not have a spot to specify which domain it is for). Support installed the SSL on the wrong domain, then demanded my client purchase a second SSL certificate for the correct domain. They then, without authorization, charged my client for an additional SSL; this is a fraudulent transaction. I had to take to twitter to even get the ticket escalated, but then escalated support did nothing to help; they just said we had to pay more money; they didn’t undo the fraud bill or even bother installing the SSL that they wrongfully charged us for. Throughout the process, support would just glance at the ticket and close it; their responses indicated that they either did not understand or didn’t care, because all they did is acknowledge I had a problem, then close the ticket. A random different person would respond to the ticket each time; I’ve been bounced between about FIVE people, each less helpful than the previous. They used to be good – but stay away now! I signed up for a 2 year hosting plan with some add-ons – security scan, SSL, etc. Then at time of renewal, the ASO had been bought out – appears they no longer are in Austin, TX, but somewhere else. Can’t phone them. Can only live chat them. At renewal, I revised the order to remove a couple of items and confirmed I no longer needed them. Then when I looked at my credit card bill – surprise – I was billed double for services I never wanted. After another long period (approaching an hour) in the chat (it takes them about 3 minutes to respond to each chat query – seriously, it seemed like they had to get the dictionary out to figure out English) they said they would open another ticket for billing. When I said to cancel my account, they said that I could not get a refund (it’s been less than a week since my account was renewed supposedly for fewer features). When I asked why, they said only new accounts get refunds; existing accounts don’t. Seriously – run as fast as you can away from ASO. I had been with ASO for about seven years. I never had a problem until, without warning, they disabled R1Soft backups. These were extremely convenient. If a file got changed or deleted inadvertently, it was easy to go into cPanel and restore a previous version of the file. This backup feature was turned off without warning. Now ASO wants to charge extra for a similar service or have me contact support so they can restore a single file. This is all beside the point though… If your service provider is going to mess around with something as critical as a backup without so much as sending you an email, stay FAR FAR away. I will never trust them with my data again and made the switch to SiteGround. I have been using it for 2 years and this time it was a really bad experience. First they prebilled me before 15 days and after getting with their support who are too slow to respond and mentions to me that it cannot be refund as I have already used the service. What a joke as I could just laugh. A prebill whose service is yet to start after 20 days has been used by me. After waiting for a lot and getting through their stupid representative I got refund but not the domain renewal. As they claimed that it's non-refundable. A new monthly bill was generated and I paid it after 2-3 days. A few days later I receive email from my client that their website is suspended. I was shocked to hear that and when I checked my mails I see that my account has been suspended for non-payment and fined for overdue. I already paid it 10 days back and they just suspend my account and when contacted the representative took 20 mins to just check this. This is quite frustrating and I could only say good bye. Everytime I need to contact support, I need to do it for 2 to 6 times for the same issue. They do not resolve issues at all while they say they do. It happened a few times about server errors, disk space shortage and emails. The worst that happened recently: I was not receiving emails. Their server had an issue and they did not ever told me. I noticed because clients told me I was not answering. I had to contact them multiple times and they always said they were looking into it. 2 weeks later, it was still defective and the emails were definitely lost. I might have lost many opportunities through this issue. I had to contact them several times, because they were not doing follow-ups except telling me it was on the priority queue because of the importance of this issue. They told me the emails were retrieved and case closed, but some clients transferred me confirmation messages of emails I never received. Get off while you can. Get off before it blows in your face and they “empathetically” care while taking a week to get back to you. Been with ASO for 4 years. Never again. In past 3 months have had 2 major outages. One in which our SSL was removed and our site redirected to another of their customers and another where someone at ASO deleted our domain from their server and deleted our CPANEL. it took them a week to resolve the situation. ASO is junk, their customer support is junk. Stay away. This is a really bad service. I use it only for email since I thought that would be safe. However that is not the case. Problems take forever to get solved and they seem unable to manage to even maintain their SSL certificate – which has been a problem for 2 days now with no resolution in sight. Really a bad idea to get hooked into this mess since it is somewhat difficult to move your email. It’s just as bad as all the other reviewers say. It’s so disappointing. I locked in to a 3 year plan at a good rate, but I regret it. I’ve been with them for half a decade and now, it is terrible. It used to be so good. I’m online with tech support as we speak for a problem that has persisted for a week. My websites email system has been blocked by ASO for no reason… “RBL block on domain” and they have not unlocked it. I’m losing clients and it’s a huge circle jerk trying to get some South Asian tech guy to take the block off my system. I want to cry, it’s just so bad. Use to be a good host. Now NO phone support, only chat. Offshore support, never understood my issues. I’m a developer and web marketer for 25 years and the techs did not understand the issue for me. The downtime was really bad. Had about 25 tickets in 2 years. They just don’t get it. ASO used to be great. When I initially signed up, they had the best customer support in the industry. I know, because I looked at dozens of hosts and that was one of the things I wasn’t willing to compromise on. Now their customer support is terrible. Possibly the worst in the industry. Average time to RESPOND (not resolve) a ticket is like a week. If you have an even slightly complicated problem, expect it to take weeks or months to resolve. Completely unacceptable. I know they got bought out a few years ago, but I honestly don’t know how they could’ve gone from being so great to so terrible in a few short years. They must’ve axed their entire support team. Insane. Small Orange is the worst hosting ever! My account was hacked because of their bad security and after I had a web programmer fix the issue they told us it would be activated immediately. Over 2 weeks have gone by and my account is still suspended. No one responds to me and I have sent 10 emails to them. I’ve been around a lot of hosts. This is the first host that is so bad that it prompted me take time to write a bad review. If you like a host that can and will pull your site down for any reason – you’ve hit a bandwith limit, they’ve detected an insecurity in WordPress – then take over a week to restore access – then this is the host for you. Probably the most incompetent host on the market. Their support is perhaps the worst in the industry. Their staff cannot resolve trivial issues, and are incapable of responding to tickets in an even halfway acceptable timeframe. As of this post (3/31/2017) I have 2 unresolved tickets that were opened over 6 months ago. Nice. Go with DigitalOcean or something else, but avoid ASO like the plague. As a design/development firm that resells hosting to its clients, I can tell you with confidence that A Small Orange is the worst hosting provider that we have ever used in our 20 years in business. I apologize to the writer of this review for being so blunt, but clearly you have not spent enough time with this provider to draw a conclusive rating. We had 9 servers with A Small Orange, hosting nearly 300 accounts. All seemed well in the beginning – the server speed was decent, the support ticketing system was responsive, and all in all life was good. The problems began after the acquisition by EIG. Apache and HTTPD crashes were daily occurrences, followed by a very extended outage for nearly two weeks over Christmas 2015. We began moving servers away from A Small Orange in early 2016, but left a few there as to not keep so many eggs in one basket. However service continued to decline. Recently, their support has been outsourced, and the ability to submit a support ticket was removed entirely! There is no support phone number, but merely a ‘live chat’, which in general takes a very long time to connect to an agent, and once it does, it is obvious that this agent is in Pakistan or India – no issues there – however the comprehension of the English language simply isn’t there, and their responses generally take between 4-5 minutes, even for relatively simple requests. What’s more is that after they establish there is an issue with your service, they create a ticket for you, which many times remains open with no response for days. I believe the quickest turnaround for an administrator to respond to a ticket we’ve ever seen was just shy of 48 hours. When issues arise, we are generally left with no ETA, and once the problem has been resolved, no explanation of what occurred. Just this week, they unexpectedly changed our WHM password for one of our machines, which almost seemed to have been done in response to my comment to a support agent regarding our intended migration away from their servers in entirety. When asking the live chat support agent for the WHM password, they questioned why I needed it. First – when you’re a reseller and have 20 client accounts on a server, you need access to WHM to manage those accounts! Second – Why should it matter what I need the WHM password for? Does saying that I need it so that I can use the Transfer Tool to begin my migration away from A Small Orange warrant them to withhold that information? I would think not! Luckily I was able to locate a reset password option from within their cloud command GUI, which, I might add is the ONLY thing I find beneficial about their service. We host the majority of our sites through Known Host now, and have had a wonderful experience so far. Their support is quick, witty, and most importantly, available. There is the ability to submit support tickets and even a live widget for average response time – I believe ours is 2.9 minutes. We also host through Hostwinds, which has been okay, and Hostgator, which we ended up moving away from after similar issues to Small Orange (they’re all EIG owned, so it sort of makes sense). In short, if you are a hosting provider looking to resell a shared VPS, please heed this warning and go elsewhere. There are many other reputable providers, that are even much less expensive than A Small Orange, too! They were bought out by EIG. Since all aspects of the service have suffered. Especially Support, it is none existent. No phone contact of any kind, not even sales or pre-sales. No direct email support. Stay clear of all EIG hosting companies. They don’t seem to care about end customer. If you are thinking of writing a blog, I recommend ignoring all of the promotions sent to you by A Small Orange. Promotions from this company imply that payment to them is necessary to register the domain needed to write a blog. It is not necessary to register a domain with A Small Orange to write a new blog. My recent experience with A Small Orange has been filled with exasperating frustration. This company automatically charged my bank account to renew my domain registration without advising me until the transaction had be processed and posted to my account. When I cancelled the domain registration account within the required time period, the company refused to refund the renewal charge. The Terms of Service posted to the A Small Orange web site state that the company will bill their renewal fee, “up to 15 days prior to your renewal date.” The invoice billing my renewal is dated 20 days prior to my renewal date. The Terms of Service state that the domain registration account must be cancelled, “at least 48 hours prior to the renewal date.” It states that if the customer does not cancel during this time period, the customer will be billed for the renewal and is responsible to pay the renewal charge. I cancelled my account 3 days prior to the renewal date. The Terms of Service require the customer to contact its billing department by email if there is an error made by A Small Orange in their billing. When I attempted to email the billing department, my message received only an automatic generic message directing me to the company’s web pages for customer support and the chat page. The two days I attempted to connect to these web pages they were not functioning. The $65.00 renewal fee taken from my bank account pays A Small Orange, a year in advance, for use of a domain that is cancelled and not in use. The $65.00 collected by the company amounts to a donation from a customer who will receive no service in return for the money paid. When I read through the Terms of Service for all of the services offered by A Small Orange the general message becomes clear. The proprietors of the company, Garret Noling and Mohsin Kamal, designed and operate A Small Orange so that it will exploit a popular social trend, mislead and confuse the prospective customer, promote a service fee as necessary when it is not, collect as much money as possible, and perform absolutely no customer support for domain registration customers. You can register a domain with other web hosting services such as WordPress.com for a much lower fee. You can write a blog without the frustration of associating with companies like A Small Orange. I have been with ASO for a few years. Recently I have noticed that support can not answer any question, no direct contact to email on EVEN a phone number to call. Stay clear. Godawful Company and service. Feels like the review I just read is disconnected from reality or has been paid for by A small Orange. I have had many different hosting accounts with several different companies. This company is in a league of it’s own when it comes to terrible service. If you take the time to search for reviews for this company you will see some consistent themes. Terrible downtime. My site was down for over a week before I moved my service to another provider. At no point did they contact me or provide an apology. You read correctly a week, not minutes or hours. This cost me thousands of dollars, wish I had paid more and dealt with a real company. Customer service does not exist. It's either bots or people just copying and pasting the exact same message over and over again. I’m not joking here, I received the exact same email each time after responding to their email. Not acceptable on any level. Add to the mix fraudulent billing practices and you have a completely useless provider. Stay away, not worth the couple dollars you’ll save every month. My ASO account was hacked. Multiple BUSINESS sites taken offline. ASO support rep “submitted me for site restoration”. That was OVER A WEEK AGO! Multiple follow ups on my part have resulted in NO RESPONSE. ZIP. NADA. Inexcusable. Use them as your web host at your peril. I would never recommend ASO to friends, family or anyone I know. The reason is quite simple: after years of being a faithful customer, they took my entire website down, my livelihood, without warning on Christmas Day because my site reached a bandwidth quota. I didn’t get the notification until I had over 100 customer complaints about my website being down until the next Monday. I had to give out tons of refunds. 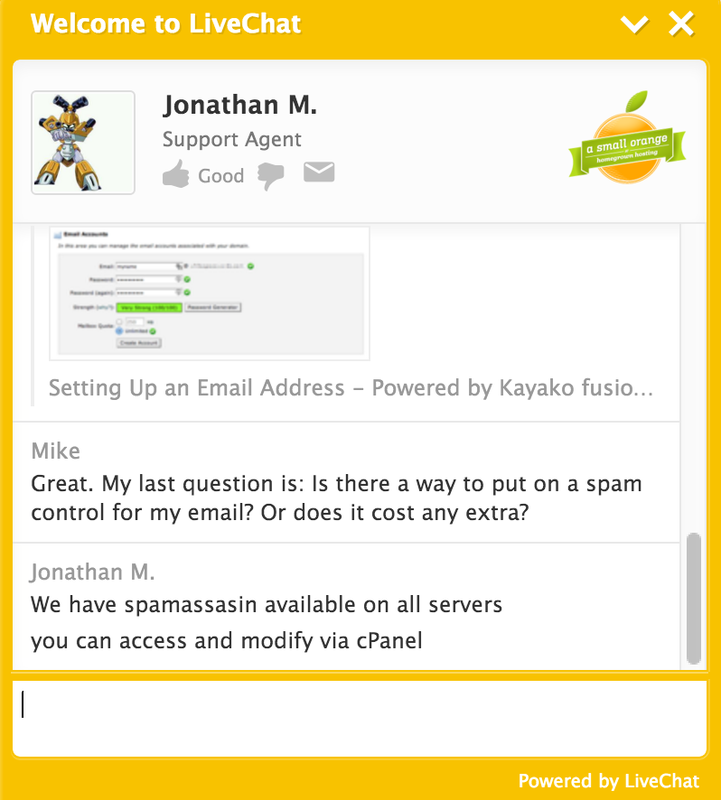 Considering legal action against ASO… DO NOT use this host!! After hosting with several other companies over the last decade, that all went down the drain (decreasing support and performance, what’s new? ), I moved to ASO 2 years ago. They were considerably more expensive (‘Large plan’), but I figured it would pay (as it is a cut-throat industry). And they were worth the extra money: great support, good uptime. So I renewed for another year. Big mistake. They are now squeezing it like a lemon. First thing to make more bucks is to ditch (email) support. Without notification, of course. So when I didn’t get a response after a few days, which never happened before, I tried live-chat, with a ‘friendly’ guy – Indian, it appears, so I guess they started outsourcing it. When I mentioned email-support not working any longer, it not being right, he just ended the chat. So ‘friendly’. Problem solved. For him. Their uptime is certainly under 99% – regular outages (every few weeks?) of a few minutes, 10 – 15 minutes and one time even 4+ hours. I do keep track, using different monitors, but it is hard to come to a final number. Also, mail-outages – sites are up, but mail is just not delivered (or only after several hours, clients calling to check…). I’m definitely moving away from them – which is going to be a total pain, again – not only finding a decent alternative, but also all the hassle of setting up new (email)-acounts, instructing clients etc. But loyalty is a two-way street and that small orange let me down big time. A Small Orange used to be good until they were bought out. This once great company is in shambles. The service is horrible and the uptime is terrible. My site is completely down for the second time this month due to them having problems handling their VPS’s. The first time it was a short blip, maybe the site was down for an hour. This is the second time and my site has been down for over 24 hours now. I have no timeline on when the issue will be fixed. I should have switched LONG, LONG, before I let it get to this point, but I didn’t. This is THE WORST hosting provider that I’ve ever had to work with. I wouldn’t host my website here even it was free. The money I would lose due to downtime would be much more expensive than any other provider in the world. Good hosting, but not the best support team. So recently, I moved one of my sites to A Small Orange after seeing so many recommendations and suggestions on Facebook. From the overall design of the website, it looks like this hosting company is legit. It turned out their shared plan was not that bad. I had nothing to complain about since I’m a beginner anyways, so I couldn’t investigate more into the server. But overall, solid speed. However, when I’m stuck in a given situation, I tried to get in touch with the support team via live chat. Oh man, the most horrifying experience ever. While the loading bar is almost completed, I never get to see a support person. Five mins go by and then ten mins and then 20 mins. The loading bar just finished filling up but still no sign of support person. They need to improve on this part. I bought ASO yearly plan ~6 months ago and I have to say that I’m pretty pleased. Their support could be faster, but eventually they get it answered and help you out. Here’s a quick tip: When you need help from ASO, use ‘Live Chat’ or ‘Phone’ options – in that way you’ll be sure that you questions get answered quickly. Any support ticket submitted has required days if not weeks to be resolved. Today (2016.8.10) I still have had no response to a ticket from 2016.7.30 and this has been the pattern all along. It hasn’t mattered for the last two years as I was still considering transitioning to freelancing. Now it matters. We tried to run away from one of EIG’s other hosts to ASO, thinking it would be better, it was not, the staff was rude, and not just that, but I would call up with a problem, and as they dug around trying to fix it they would start fiddling with other parts of my website, such as htaccess, causing all sorts of new problems for me which compounded the original problem. ASO had massive downtime for us, we were very dissatisfied with them, the final nail in the coffin for us, which almost put us out of business was a full week of consecutive downtime from Dec 26 until Jan 2 2016. Inexcusable, we jumped ship. I signed for A Small Orange as my hosting provider a few years to set up my own personal site. I was drawn in by their affordable shared plans and their commitment to being ecologically responsible. I have almost never had issues with their service and their technical support is very fast and helpful. I would definitely recommend them to anyone for purposes ranging from a small personal site, all the way to a large e-commerce site. Good job and keep it up! I have had a great experience with A Small Orange. They have even taken my feedback and implemented the change in communications I suggested in just under a month. I have had zero issues with uptime and performance, and I feel like I’m getting the better end of the deal. This is my second site so I have some experience with hosting providers, therefore the problems I have encountered were not that new to me but I found a lot! First in first I admit that the support team was always there to help me in all of these problems despite the fact that it might be out of their support scope. My overall experience with the support at A Small Orange is good, yet it could have been better, but at least they helped me. Waiting time for support is between couple mins to 30 mins max, which is almost the best within server providers. When I first launched the site, I had a lot of issues with downtime (2-3 hrs per day), which was really annoying. But after the first month or so, downtime became non-existent, and now everything is normal. As I pay for the hosting every month, I have issues with the fact that they issue the invoice around 15 days before due date and try to make the transaction many days before the date I’m supposed to pay for it. Still it is the only hosting provider,that I’m aware of, which gives you the option to pay for their services on a monthly basis, while providing an okay service. This is my best experience with server providers in a long time, despite the few annoying things at first, it’s really an okay solution for your server needs for a pretty low price. I’ve had an account with A Small Orange for several years; however, I mainly use it for personal web development projects or testing. I can’t speak to their uptime for more extensive use. If you have a reseller account, it’s very easy to manage multiple domains through WHM and split your storage space among them. Having Fantastico already installed in cPanel is nice for non-technical people. If you want to upgrade your package, that’s really easy; if you need to downgrade, you have to do that through customer service. They are usually pretty fast though. I’ve been using A Small Orange for the last year or so. They have a great sales team and customer support, even for dumb mistakes. They have been having some uptime problems lately however and I heard they were recently acquired by a lager organisation with a reputation for allowing standards to stagnate and slip at the expense of the faithful user base. Time will tell if this turns out to be the case. We moved to A Small Orange from our previous host after doing extensive research. Even though ASO was a bit more expensive than some other hosts, we went with them as they had great reviews and promise a “Homegrown Website Hosting” service with great support. Oh boy. This company, who is now a part of the huge EIG conglomerate, is a complete mess. – When we reported spam that we were getting from a 3rd party, they locked OUR account, without investigating who the abuser and who the victim was. – The downtime is extremely frequent, and happens weekly. – They deleted a bunch of files on our hosting, without letting us know. This was apparently due to a false positive by their updated malware scanner. They did not contact us to let us know that they had updated the scanner, or that any files were deleted. When this was reported to them, they took TWO WEEKS to get back to us, despite numerous emails. – If you have issues with abuse or mail deliverability, live chat or regular support CAN NOT and WILL NOT help you. They will create a ticket and forward it to the abuse team, who does not work 24/7. On top of all that, their tone and their approach is nonchalant and unapologetic. They really sound like they do not care about their customers, and it shows. A Small Orange has been a huge disappointment, and hosting with them is simply not worth the hassle. We’ve had numerous hosts over the years, but A Small Orange takes the prize as one of the worst web hosts ever. A small orange’s hosting has really gone down recently. I heard they were acquired and often that means that the geniuses show up to do their “cost optimization.” It has taken me 20 minutes to get onto their instant chat. This is why I hate acquisitions, the quality always seems to go down. Tickets are now super slow to get fixed, but they used to be all over tickets. I just bought the ASO hosting Tiny plan few days ago and so far I’m satisfied. They activated my account almost immediately and I managed to set up my WordPress site quite easily. It is my first site and I do not have much of experience with hosting providers, therefore the problems I have encountered were new to me and they were MANY! I must admit that the support team was always there to help me in all of these problems even though it might be out of their support scope (they helped me with a few WordPress issues and they didn’t have to). My overall experience with the support is good, yet it could have been better. Waiting time for support is between none to 30 mins, which is not that much. When I first launched the site, I had serious issues with downtime (1-2 hrs per day), which is A LOT! But after the first month, things became normal and now site’s downtime is zero. I pay the hosting every month and I do not like the fact, they issue the invoice almost 15 days before due time and try to make the transaction many days before the date I’m supposed to pay. Yet it is the only hosting provider (that I know of) that give you the option to pay for their services on a monthly basis. I led the charge to move my employer’s hosting over to A Small Orange years ago. We use it for hosting multiple business websites. It’s well priced and you get a lot of bang for your buck. They offer good, modern options. They also used to have great customer service who would respond in a matter of minutes–that was the big selling point. But my recent experience was not great. They alerted us about an emergency migration. After the migration, a website did not come back online. Our team’s initial troubleshooting didn’t turn up anything so we submitted a support ticket. After waiting hours with no response, I updated the ticket again. Still no response. Finally I tried their chat support. After waiting in line to get into chat, the tech support person told me they’d have someone look into it. It was finally fixed after 6 hours of downtime. My most recent experience with their support team means I won’t recommend A Small Orange anymore. How does ‘A Small Orange” rank vs. competitors?